This is the second blog post coming out of some recent research here at ILS which made me think about how things have changed in Estonia over the past 20 years. The average of my students 20 years ago was 25-35. 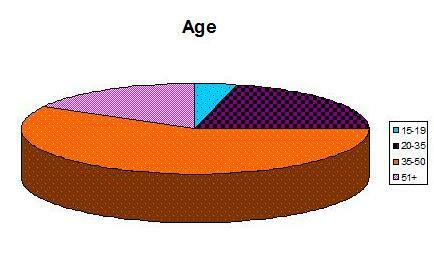 As we can see from the pie chart, the largest single age group today is 35-50. Why is this? Do younger people not need to improve their language skills? Some people say that teaching standards have improved so dramatically that consequently, all young people speak great English by the time they leave school. However, I seem to recall that there was something of an English teaching crisis in Estonian schools in the early to mid nineties when language teachers left the profession in droves for greener pastures and in some cases, students were teaching students in schools. So, I tend to think that whilst teaching standards may have changed, I rather think that the opportunities for young people to learn and use English outside school are so various now, that it is increasingly rare to find a person under 25 who can’t get by in English. People in their late thirties and older who find themselves on the job market are finding that English skills are essential to get a job and this is a big motivator for some to go back to school.